Understanding the profile of clients, and their wants and needs, is vital for any brand. Companies that know what their target audience wants will be able to reach their clients more easily. By basing themselves on data and information acquired about the profile of consumers, brands are able to design the necesssary strategies in order to achieve their goals more successfully. But, how does one gather, order, analyze and extract value from all this information? In this post, we share with you one example, that of the recent collaboration between LUCA and La Vaguada Shopping Center in Madrid. Figure 1 : Image of the inside of a shopping center. LUCA has worked alongside La Vaguada in a project with the aim of better understanding its clients and the challenges it faces as a shopping center, largely due to the arrival of online shopping. Jesús Hernández, assistant manager of La Vaguada and the person responsible for the area of innovation and marketing, shares that with "the arrival of online shopping, which still has a relatively low market share that is growing, represents a competitor for local retailers". One of the advantages that online retailers have is that they obtain a lot of information about their clients in real time and with ease. 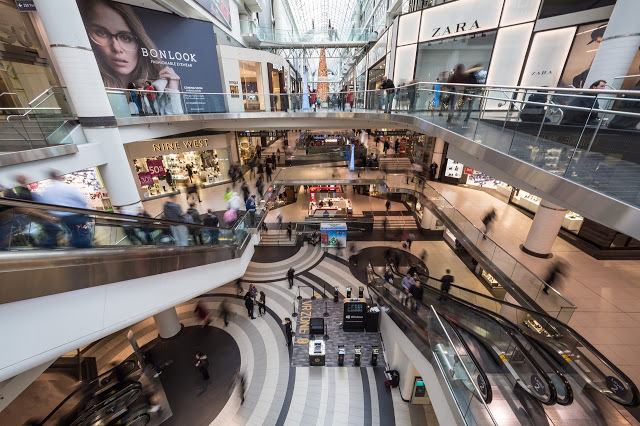 Physical retail spaces, on the other hand, have until now only been able to obtain information via surveys and this has required client participation. For this reason, the collaboration with LUCA has worked to reveal insights about the shoppers with access to historical and real time information, something which was previously impossible. Thanks to this project, La Vaguada has been able to take concrete actions, as they undrestand the type of clients that they have, their profile and origins. For example, they can direct their marketing actions towards areas from which they could attract more visitors than they currently see. Additionally, they were able to change their communication policy in order to adapt to a style, language and method that would help them reach their target audience.